occurance, or something from our past. However, if something in the past or present environment is blocking you from being happy, you are wasting your life. I know this sounds harsh, but you are alive at this time. Imagine a doctor has just told you that you have six months to live. The doctor is telling you, “Better get everything in order now.” How would the problem(s) you have now seem compared to the news you have just received? Let me tell you, the next six months of your life is just as important as the last six months of your life, and if you are unhappy now, then you are wasting your life. I have decided to write an ongoing blog to help anyone that is out there that is not happy. I tell you now, being happy is more important than being wealthy or famous. I have known many wealthy and even many famous people that never seem to be happy. There is always an excuse for the lack of happiness, but no one wants to be unhappy, they just are. What a waste. There are many reasons for our unhappiness. . . the loss of a loved one, lack of money, working at a job you dislike, fear, illness, an argument with a spouse, friend, or family member, and the list can go on and on. However, it’s how we deal with these outside situations that matter, not the problems themselves, for all unhappines comes from within. This might, at first glance, be a hard pill to swallow and why take any advice from me? I can only say that I have also lived a life with all it’s problems, with many ups and downs. It has taken me a lifetime to figure things out, but for the last twenty or thirty years I have been consistantly happy. Sometimes a problem comes up and I fall off my stride, but before the day is done I am happy again. I really want to help as many people out there as I can, because I have been very lucky in my life. I have found how to maintain a happy existance. . . not because I have great wealth, although that is what many believe they are striving for, but because I believe I have found life’s true purpose, which is to be happy. Possessing wealth is not necessarily bad, but chasing after it can be an empty goal if we have not learned to be happy. Derek Berman has a degree in mechanical engineering, but found his true passion in the music industry. He joined a rock ‘n roll band called The Echoes, playing guitar for Jerry Lee Lewis, Conway Twitty, Roy Orbison and many others. The Beatles were the warm-up band for The Echoes at The Cavern Club in Liverpool. Since then he has worked as a recording engineer and record producer in the UK and US. Derek has managed theatrical booking agencies and booked big name celebrities. In partnership with Bob Tarantino, head of promotions at A&M Records, Derek and Bob were instrumental at the beginning of House & Rap music in Chicago. 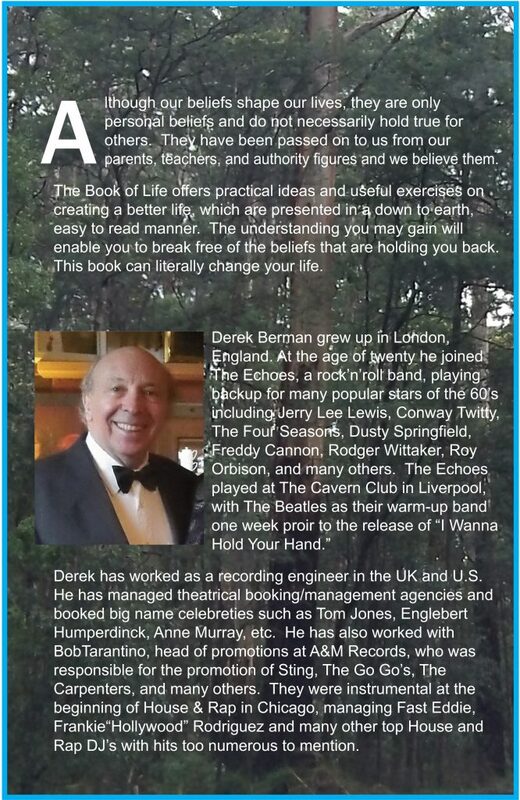 Derek has written The Book Of Life to help the reader create joy in their life. In this book, he shares the knowledge that the beliefs we hold about life create the lives that we live. New Kids on the Block is my favourite pop-band of 90s. NKOTB had so many hit songs! The ones I remember are ‘Tonight’, ‘Baby, I Believe In You’ and, of course their hit ‘Step By Step’. These are real masterpieces, not fake like today! And it is awesome NKOTB have a tour in 2019! So I’m going to attend New Kids on the Block concert this year. The concert setlist is here: New Kids on the Block tour Philadelphia. Check it out and maybe we can even visit one of the performances together!